Contemplation. Procrastination. Hesitation. Have you ever suffered from any of those things? I know I have – especially when it comes to cars. We all have tons of ideas, some more unrealistic than others, then when the time comes to go ahead with a modification or an upgrade on your car, there are a lot of variables that come into play. In many cases it’s the budget that holds us back from realizing our wildest dreams, but you know what – it doesn’t need to be. Sure, having a ton of money to blow on that hunk of metal in your driveway would make things so easy, but what about doing the best you can with what you have? 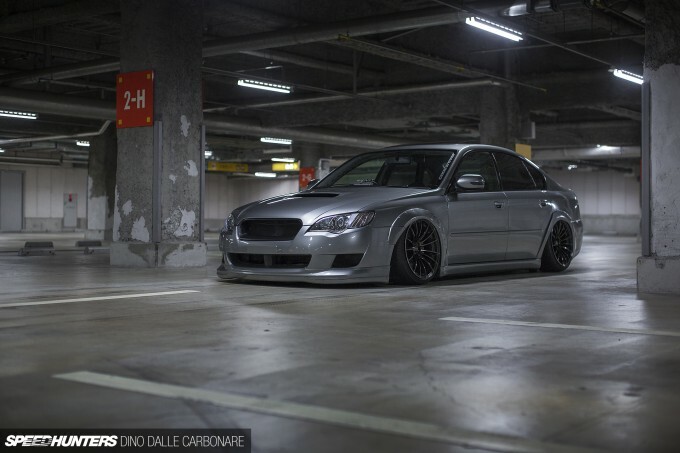 This is Shingo Kanda’s 2006 Legacy B4 Spec B. It’s a car that I’ve been keeping a close eye on as it’s evolved over the last couple of years, mostly because it’s been modified in a really inspirational way. You see, Shingo has tackled every upgrade and modification himself – most of the time doing the work outside the front of his house. 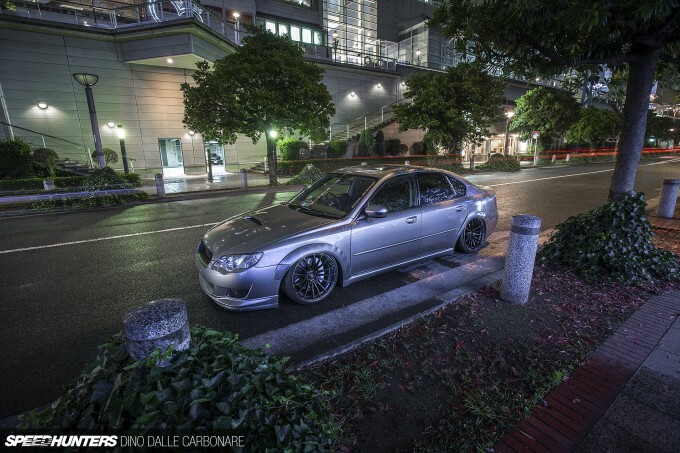 And I’m not talking about mundane jobs here, but the sort of custom work that has turned his Legacy into one of the coolest Subarus on the streets of Tokyo. His work hasn’t gone unnoticed either – a recent feature in Legacy magazine proves that. 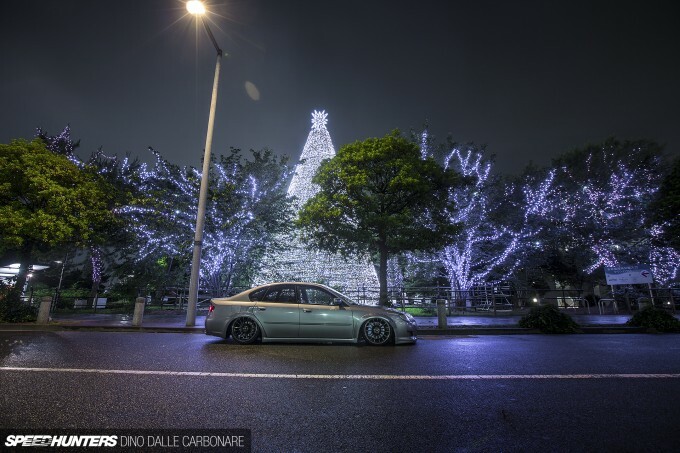 Shingo is also looked up to as a sort of ambassador of the stance movement – especially in Subaru circles, where he’s captivated the minds of many owners. His car is the result of a lot of trial and error. Shingo comes up with ideas, tries them out and then takes things on from there. 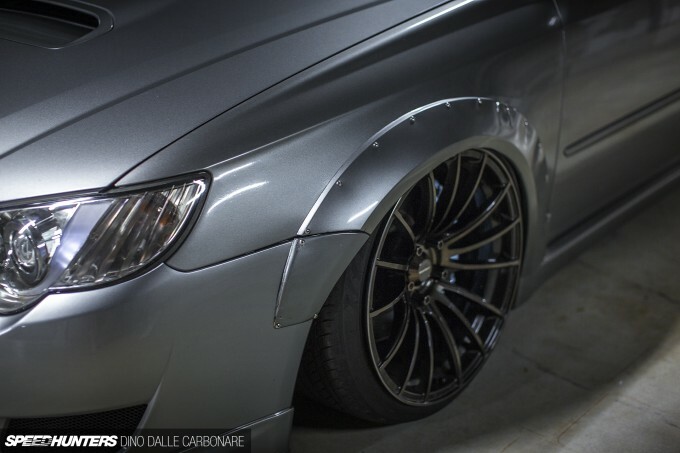 The Legacy’s custom over-fenders are the perfect example of this. They’re the final touch in a modifying menu that started with a substantial static drop to get that oh-so-cool tayazuri look where the fender sits flush with the inner edge of the wheel arch. To achieve this, the inner portion of the fender had to be cut and rolled to avoid rubbing – something that ultimately had to be taken care of with some brute force to gently deform the arches so everything fit. 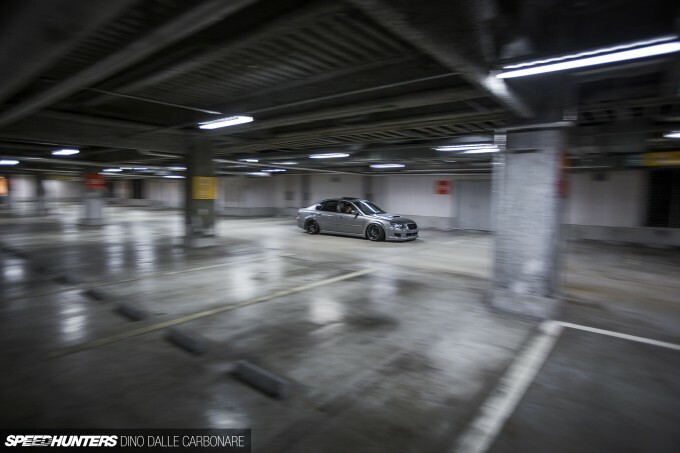 But it wasn’t a hack job, Shingo sanded down the edges of the fenders where the paint cracked form the widening, and laid down some primer before hitting it all with a few layers of the light metallic silver Subaru hue. That solution worked for a while and the car stood out, but Shingo wanted more. 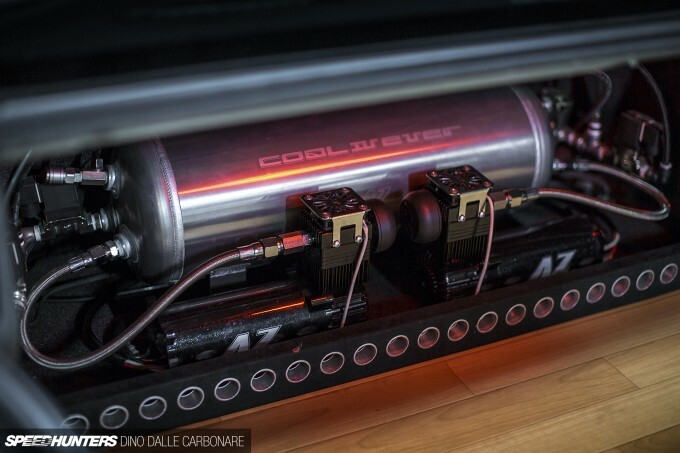 Air suspension seemed like the logical next step, but given the sheer cost of a full system and installation, it was always going to be a challenge. And with the potential to go lower than the static setup allowed, it also called for some rethinking in the looks department – which is when Outback fenders came into the picture. 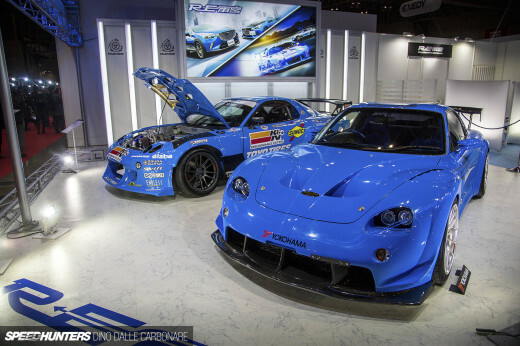 While the best solution was going to be a fabricated widening of the front and rear wheel arches – much like what we see on VIP sedans in Japan – the cost was just going to be too much for Shingo. Not only that, but seeing that the Legacy is his daily driver, he couldn’t afford for it to be off the road either. So with a bit of apprehension he did the next best thing: cutting the fenders and screwing down the color-matched flares. Desired effect achieved! Shingo took a leaf out of Kei Miura’s book of modifying by using exposed screws and creating a little finisher section to fix onto the front bumper to give continuity to the flaring. Some custom touches were also called for at the rear – specifically where the flares merge into the bumper – where Shingo had to create the gradual transition that blends away. He isn’t overly happy with the final finish, stating that painting is damn hard – but I’m sure he’ll try and try again until it’s just right. The bespoke touches don’t quite end there though. To get the car to sit as low as possible it was necessary to get rid of the existing lip spoiler. In its place now is the lower section from a Subaru optional splitter, which was fashioned with an angle grinder. Some glue and a few screws later and the job was done – maybe taking a little inspiration from the way Nakai-san at RWB attaches front lips to some of his 911s. The next job on the agenda was to attack the roof, and again the angle grinder came out. Shingo measured things up, took a deep breath and cut out the rectangular section where an aftermarket, electrically-operated sunroof is now fitted. 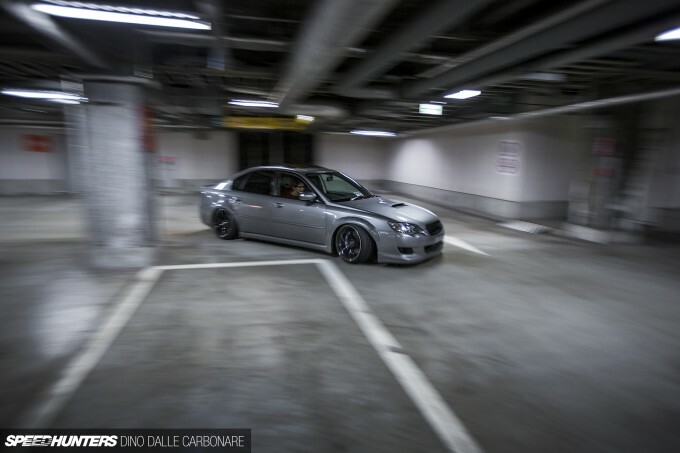 Seeing as Legacy sedans were never offered with a sunroof in Japan, it automatically adds some more uniqueness to the car – much like the patterns etched onto the HID projectors in the headlights. Despite all of this work the car still manages to not look overdone, which is testament to the choice of alterations Shingo has gone for, and the way he has implemented them. Take the exhaust for example. Shingo is actually a fabricator working for the Japanese exhaust manufacturer Exart, and in his spare time his boss gave him the okay to plan out, design and fab up a custom-valved system for the Legacy. It’s still in the final stages of development but it sounds amazing – quiet when you need it to be and loud when the situation allows. Plus it looks subtle, not exaggerated in diameter nor design. In other words, a perfect match to the car. 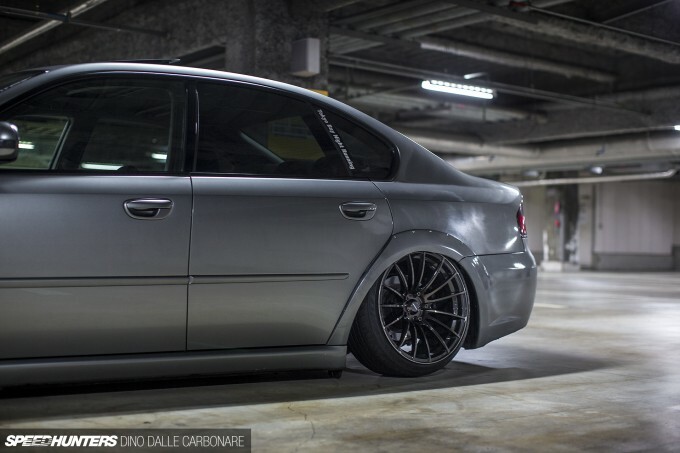 And then there’s the air suspension. Since we had an empty parking lot for the shoot, I grabbed a quick couple of videos of the car airing out – all easily done via a little remote control that Shingo keeps in his pocket. With the lowering potential that air bags introduce, you can see why over-fenders were something that Shingo couldn’t pass up. The suspension is raised up a good inch for driving around, but in the shot above it’s at its lowest. And as soon as he parks anywhere, this is how he lays the car out. The suspension is custom built around a set of Cusco adjustable dampers fitted with Universal Air bags (click Presentation Mode to animate the above GIF). The package allows Shingo to keep the handling characteristics that make the Legacy B4 quite a capable sports sedan, but have all the style that air ride brings. Behind the 18-inch WedsSport SA-15Rs hides a Brembo 4-pot front brake conversion borrowed form an Impreza STI – an upgrade that gives the bigger Legacy the braking power it deserves. And when you go for bags, there is of course the need to fit the necessary equipment to make it all functional, controllable and reliable. 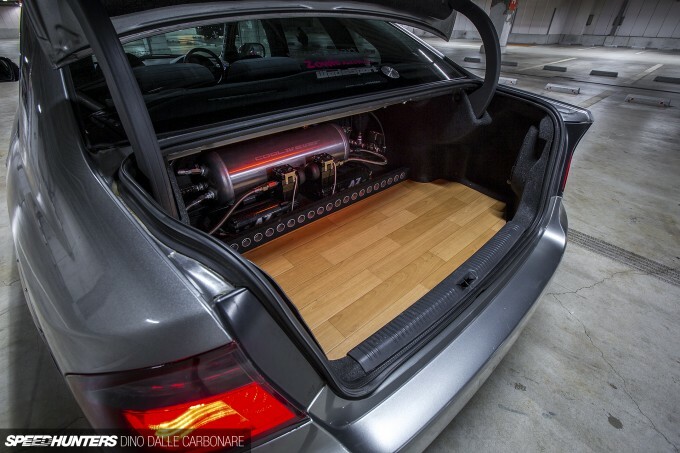 Since a substantial slice of the trunk had to be reserved for this reason, Shingo thought he might as well make it presentable, taking inspiration from some of the higher-end installs that he’d seen online. To keep costs low, the actual wood trim is actually a piece of parquet-like vinyl sourced from the local home center and then cut to size. The crux of the system is made up of a 15-gallon AZ tank and a pair of compressors, offering fast recovery speed and the piece of mind if one goes bad. It’s all neatly laid out and Shingo has even fitted a connection so that he can quickly tap his air tools into the system when he’s working on his car. So with the looks taken care of and the car sitting and handling just how Shingo wanted it to, it was on to the EJ20 sitting under the bonnet. Shingo hasn’t gone wild here, but through some select intake and exhaust upgrades the legendary 2.0-liter boxer unit has really come alive. 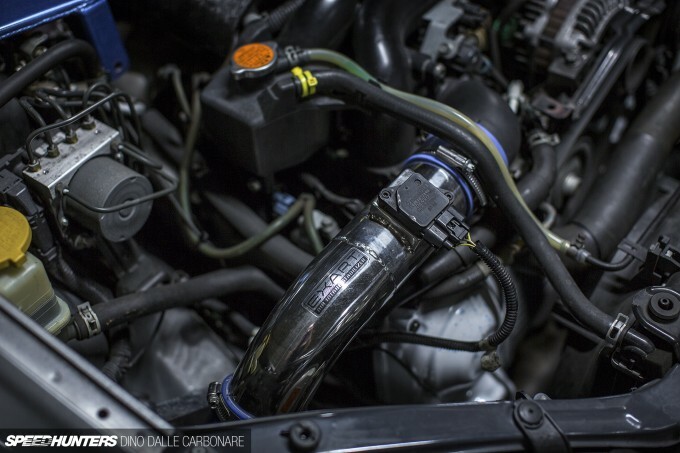 The stock airbox has been replaced with a K&N air filter positioned behind the bumper where there’s plenty of fresh airflow, and as you can see here, the custom intake pipe that Shingo knocked up at work also mounts the factory AFM. 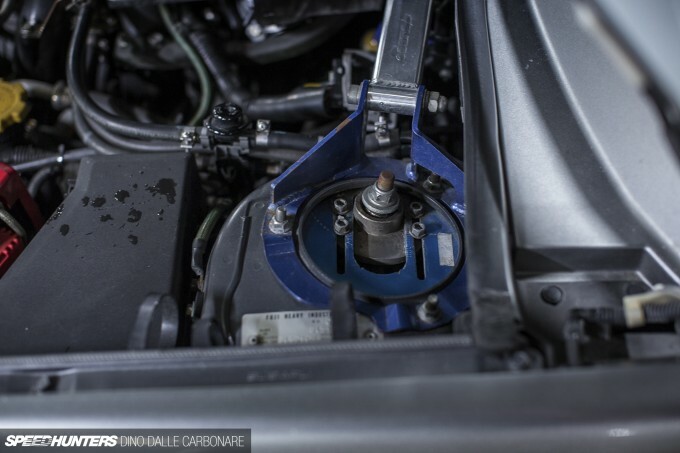 A remapped ECU makes full use of these improvements, and setup with a slightly higher level of boost the boxer-four churns out well over 300hp. Here you can see the amount of negative camber that the Cusco custom top mounts allow. 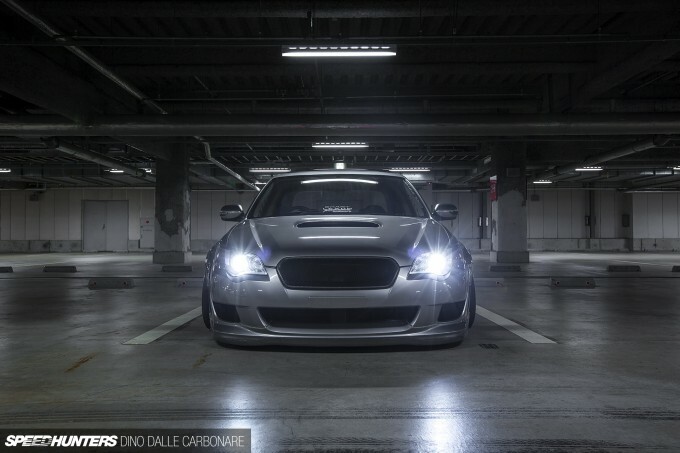 The same setting is applied at the rear to keep things symmetrical when the Subaru is laid on the ground. What really finishes the car off is the mesh grille. Depending on model and level of trim, the stock item usually comes with ugly fake chrome detailing and a Subaru badge. As I’ve been daily driving the same model Legacy for close to 10 years now, the interior is a very familiar place to me. Here, Shingo has done a bunch of interesting little upgrades to make this space his own. 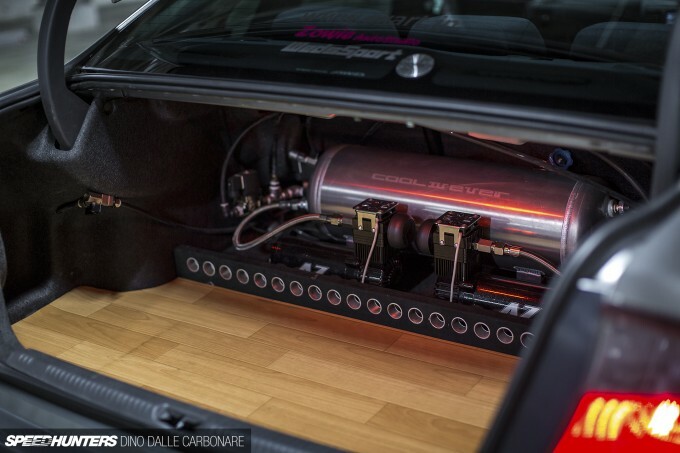 Just like the rest of the car, every upgrade and addition is his – and that includes the auxiliary gauges and the air pressure meter mounted next to the ignition. One interesting touch is the recently fitted A-pillar trim, which was inspired by the gusseted plates that tie rollcage bars to pillars in race cars. The stock seats remain, but the factory Momo steering wheel has been replaced with an aftermarket item mounted on a Works Bell boss. 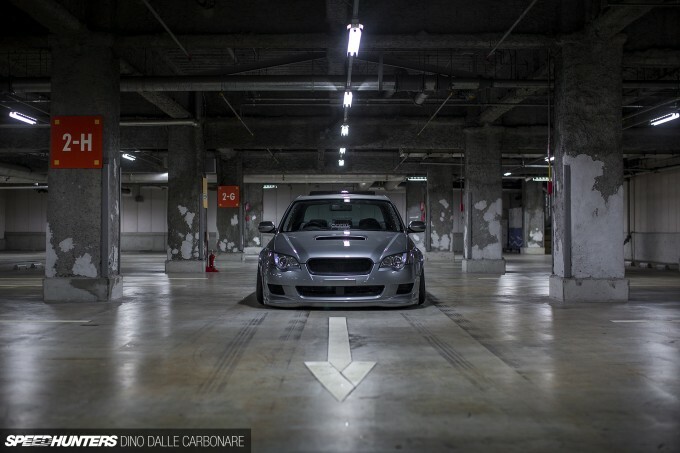 Shingo’s Legacy was an inspiring car to shoot and a reminder of just how much fun tackling upgrades yourself can be. So what are you waiting for? Get out there and let your imagination run wild! Cool car, but what's up with all that air bag and air suspension hype? This thing is getting viral, even the final front - Japan - bows (literally) to it. Nothing wrong with function and form coexisting, but what is behind this trend after all? We're talking about multi thousand suspension setups, and where is the practicality when you're facing a boot full of tanks and hoses? Interested about the valved exhaust though, as my 3" TBE + STI quads can be a bit drony at high way speed. @funky Some people like to go fast, some people like to look fast. 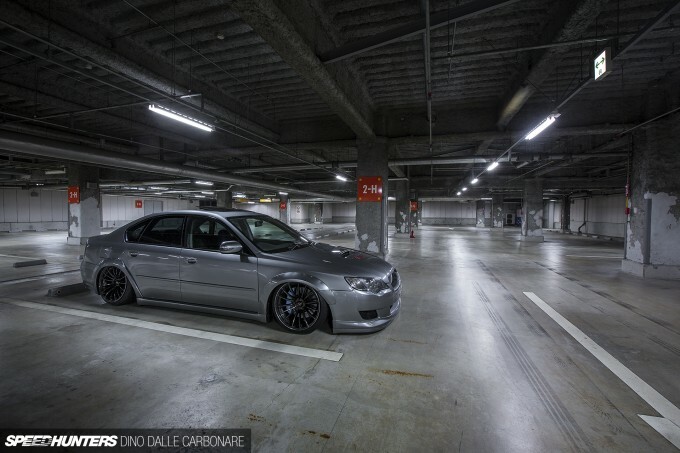 Lowered cars look nice. If you are going to lower a car this much you have to be able to raise it to drive it. So finally this is being done the best way possible. The new airbag tech is as good as it gets. Granted it's still extra weight and complexity but it is minimal as possible and makes the car drivable, as opposed to lowering something to the point of scraping every driveway and speed bump you run across. This car is nice but there's some lame stuff also. Like the strut brace with bends in it is only adding weight with no function. Those bends means it's not strong enough to add any rigidity so it's just for looks, just like the A pillar cover. While your at it why don't you put a fake roll bar? I mean who's going to punch holes in a factory A pillar? If you did it right a fake roll bar with hole punched gusset would be more believable. I got to see this awesome Legacy in person when I went to Daikoku and spent time with you, Dino. It was definitely an amazing experience, not just to see the legendary parking lot, but to get to meet my fave journalist! This car definitely deserved a feature. 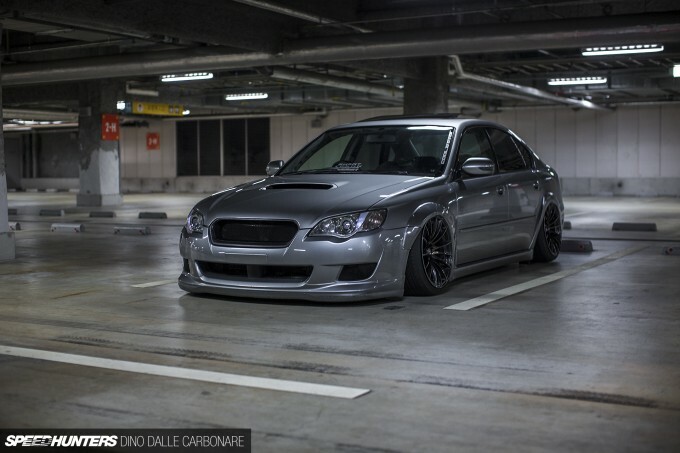 One of my favourite Subaru models looking so good. SO clean! Awesome feature, love the GIF. Does anyone know what type of HID's he is using? in the first pic. is it the cool4ever headlight system???? Chri5 Duncan Who cares about the holes. I really don't think he is trying to fool anyone into thinking its a gusset. Why do people always freak out when someone does something to their car aesthetically? "OMG! That part has zero function!" Yea? Whats the problem with that? Someone adds their own style and creativity into a project and the internet goes nuts with negative comments about it. Not your style? Great, that's fine, but don't hate on someones car because its not your style. I'm sure this dude gives zero fucks about what other people don't like about his car. Its people like him and so many others that do things differently, granted even if its little details like the pillar, that will continue to inspire people. There is a quote from a book i recently read that could really apply to car culture and all the hate that goes with it, "first seek to understand, then seek to be understood." Let that sink in. ToughDog Maybe because they don't subscribe to the "this part cost ALOT of money so it MUST be cool" theory that so many seem to get caught up in. In the real world there are many times when a cheap part is just as good or better, so why spend extra money. Besides, maybe he just liked the cheap gauge better. IanMacdonald1 Chri5 Duncan He might care, he might not. I always take what people say about my cars and evaluate based on the merit of their input. I might or might not change something then or the next time. Sometimes you get a myopic vision of how something should be and it takes another viewpoint coupled with an explanation of why something looks wrong. Just saying it looks good Iike it is fine if that's really true, but if it's not I want to know about it. There is something extremely satisfying about watching a car drop it to the floor. Thanks for the vids. Tinj Glad it worked in the end! @funky Its just stupid. Like honestly makes no sense at all. I understand low riders, even though I'd never went one. But to slam a car whilst trying to make it 'race car' is beyond retarded. Everyone can sit back and say 'lets be positive, each to there own'. Bu who cares. The worst thing is people installing airbags and then trying to fight the inherently stupid suspension decision by trying to engineer around it's issues. 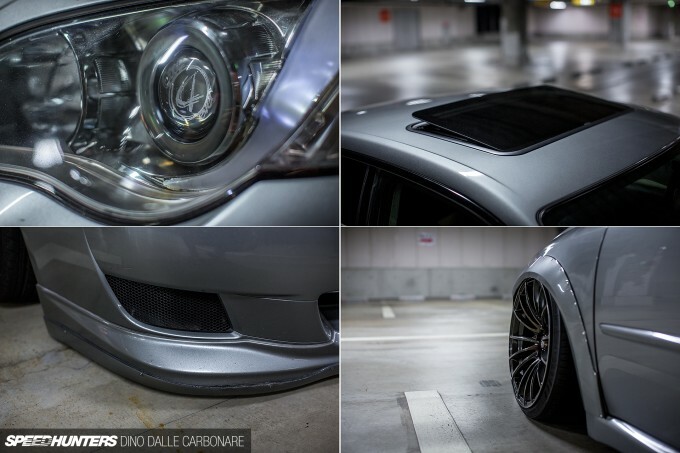 Stance is so sad. TimAukamp Visit Legacygt.com for their forums. We can help. Here's my 06 Legacy GT. The strut bar is functional. Especially if the bar was cold formed. Cold formed aluminum or most alloys are much much stronger than u could imagine. Bend a spoon out of your utensile drawer and bend it back, there will be a clear spot still bent from the first bend. Its call strain hardening. The chemical makeup is actuall improved in cold worked material. Just some science for you. In fact, its the reason why we dimple sheet metal, strain hardening. Although a direction change or bend can be a stress riser, cold working helps counteract that problem, in some cases improves things. IanMacdonald1 Chri5 Duncan I think It's understanding why these lame aesthetic decisions are made that makes them so irritating in the first place. TimAukamp No problem! This car has also helped me decide what to do with my own Legacy so thanks Shingo! Is there any chance of you going to Australia and doing an article on Marty's Super Gramps? (which I am sure you have heard of, and if you haven't, shame on you!) I know everybody in the world probably already knows everything about it, but it would be cool to see it with some professional pictures and a write up from you guys. Hey, I am trying to figure out why his body style isnt that of a 2006? if i were to buy an 05 which is the same as an 06, could I interchange the rear bumper and rear lights?